Remember back in the 1970’s and 1980’s, when everyone wore the Stan Smith‘s from adidas? If you don’t remember, let me share a brief bit of history with you, the shoe is named after Stan Smith, who won major tennis titles wearing these beauties, including the 1968 U.S. Open and the 1970 Australian Open. Well, they haven’t been on the shelves in years and now on their 40th anniversary…they are back! It’s not just the classic colorway either…adidas has introduced some super sleek apparel and even two versions of Stan Smith adidas Up shoes for the ladies! The good people of adidas told me these are flying off the shelves and won’t be around forever…so act now and get free shipping: Stan Smith at adidas with Free Shipping. Sports Techie, adidas tennis and Stan Smith Men’s and Women’s Original shoes, track tops and shirts are high-quality, products sure to enhance your Sports Techie way of life whether in Seattle, the United States or elsewhere around the tennis and sporting world. Analyzing the history of sneakers shows it is actually big business. Read the N.Y. Times article: For Young Traders, a Market Where Air Jordans Are Blue Chips, here. Collectors, which includes kids and teenagers, spend thousands of dollars on iconic shoes, especially Air Jordans and perhaps soon, the Stan Smith collection for those in the Sports Techie community who are interested in this short-term and long-term investment hobby. The French Open at Roland-Garros runs May 25 through June 8. The Rio World Cup event starts June 12 and ends July 13. Gear up with adidas and enjoy these mega live events on your mobile devices wearing your Stan Smith sneakers while playing tennis on a clay surface if you are lucky to have that opportunity (I have once in Ecuador), or else playing soccer with your friends with an adidas Brazuca World Cup Soccer Ball while wearing some of the hot Messi collection gear. Open to the FIFA World Cup in Brazil. 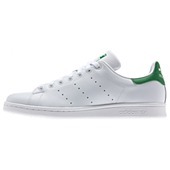 Buying a pair of sturdy tennis shoes can be frustrating, however Stan Smith will make every choice easier. 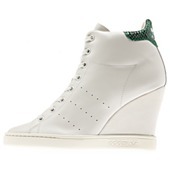 So glad the Stan Smith tennis shoes made a comeback! Bought two sets, just in case.